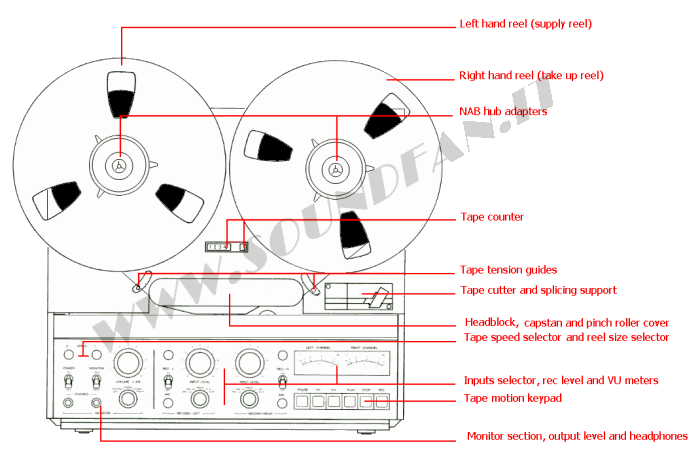 SOUNDFAN - Reel to reel recorders and tapes - What tape recorder is? WHAT A REEL TO REEL ANALOG RECORDER IS AND WORKS? This is not a fool question! Just think for a moment all music lovers born from the early 80ties might have never seen and of course never listened to a reel to reel recorder. So: a reel to reel recorder is an electromechanical device which records and plays musical signals on magnetic tape. Picture below shows a Revox reel to reel recorder front panel. Obviously recorders from different firms are slightly different one from another but the main functions and commands stay always the same for all. In general, the faster the speed and larger the tracks the better the sound quality with less noise (typical magnetic tape “hiss”) and better frequency response both on high and bass frequencies. 3.3/4 ips and 7.1/2 ips most used in domestic recording and commercial prerecorded tapes. 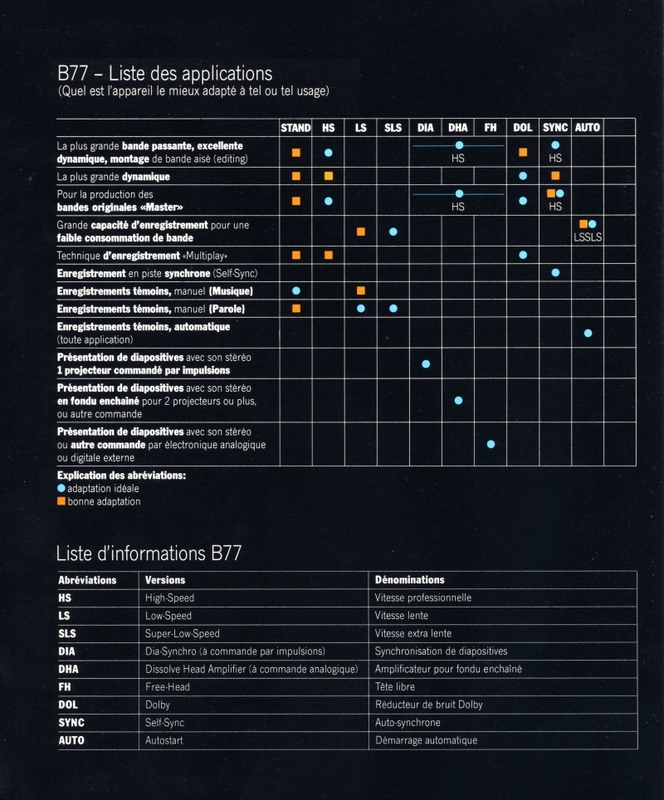 The lower one 1.7/8 ips (and lowest 15/16 ips) were for very long duration and special recordings as security surveillance, telephone recordings, etc. The higher 15 ips (and the highest 30 ips now less used) is for semiprofessional and studio master recording. Usually tape recorders have two speed (1.7/8 and 3.3/4 or 3.3/4 and 7.1/2 or 7.1/2 and 15 ips). Some more flexible models have three or four speeds instead. High quality recorders have always three different magnetic heads. the playback head especially designed for playing the signal. The cheap machines have one head only for both record and playback function switched from record to playback circuits. Because record and playback heads have different electromagnetic characteristics the best choice is a 3 heads recorder which allows you to have additional features as real time monitor during the record and mixing effects as echo, Duo Play and Multiplay. The 1/4” width consumer magnetic tape can be recorded in several way to have different sound quality and playing time.  Full track (MONO) Tape is recorded in full width in one direction only. Very High quality and standard duration. Today used for alignment reference tapes only. 2 tracks (or Half Track) (Stereo or 2 mono channels) Tape width is equally divide in two tracks for left and right channels and recorded in one direction only. High quality, standard duration. Used in professional and domestic master recording and consumer prerecorded tapes. Two tracks "butterfly heads" are used in professional studio recorders to improve stereo crosstalk level. Theses heads usually have the standard commercial 0,75 mm distance between the tracks but 2 mm distance is available in studio recorders for tape mastering and disc cutting. Keep this in mind and check if the old recording or mastering tape you are listening to fits 2 mm or 0,75 mm. 4 Tracks (Long Playing Stereo or 4 mono channels) Tape width is divide in 4 thinner tracks coupled in 1-3 / 4-2 order. Doing this way at tape end reel is turned and recorded on the other side. The tape inversion can take place manually by turning and exchanging the reels or automatically by inverting the tape direction sense in autoreverse function equipped recorders. Little less quality but double time playing. Used in domestic recording and consumer prerecorded tapes. MULTITRACK The tape is recorded in one direction only but changing the tape width from 1/4” till 2” they can be record up to 24 different tracks. Used only in professional studio recordings (typically 4, 8, 16 or 24 channels /tracks) for mastering tape. Multitracks heads: 16 channels Telefunken. 24 channels Studer. Talking about tracks remember master tape are always 2 track at 15 ips (rarely at 7.1/2). Commercial pre recorded tapes are 2 or 4 tracks at 3.3/4 ips or 7.1/2 ips. I.e. if you want to listen to old 4 tracks tapes or you are a musician and want to produce your own 2 tracks high quality analog master or you are an audiophile copying yours beloved vinyls on tape to preserve them, you need two different recorders, sorry! Some tape recorder (Technics RS1506, some TEAC model as X2000 and some Otari and Ampex) gives the chance to record in one standard (2 or 4 tracks) and playback both standards using two different playback heads switched in the playback circuit. This is a compromise but very useful solution. Pics below show the Techincs RS1506 (or 1506) heads block: on the left 2 tracks playback head and 4 tracks erase head. On the right, mounted on the other side of the heads block, 4 tracks record and playback heads.
! B E W A R E ! Before you buy a used tape recorder think seriously what are your needs. 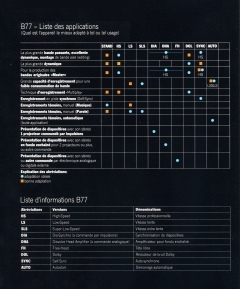 2 and 4 tracks systems and different speeds are not compatible among them. 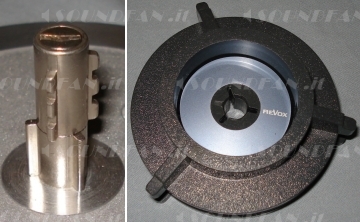 Keep in mind, i.e., the world wide famous Revox B77 open reel recorder was produced in 32 different versions looking at the same from the outside plus every kind of customized version on request (56 models in total !). Different lengths of magnetic tape are wound on plastic or aluminum flange (the reel - see the "TAPES" page) which diameter ranges from 3.1/4" to 10.1/2" for different playing time. Playing time depends on the speed and number of tracks which affect the sound quality too. Loading the reels and magnetic tape on a recorder requires a little of manual practice as put vinyl disc on a turntable. It is a nice ritual before the enjoyment of a great listening! The CINE reel (see the "TAPES" page) is locked on reel support by 60° rotation of upper part of the three splined shaft matching the “cine” reels flange. Professional and studio 10,5” NAB reels have a different locking system; the reel large central hole matches the NAB hub adapter which is locked on reel support in the same way as cine reels. Keep in mind the reels turn anti clockwise direction. The full reel (supply) has to be on the left reel support and the empty one (take up) on the right one. Usually tapes have a leader green tape at the start and a red one at the end to easily identify the side of the reel and be easily handled and touched with fingers without damage the magnetic surface. The leader tape is manually threaded through mechanical guides, in front of magnetic heads and between capstan motor shaft (turning at nominal tape speed) and pinch roller (the rubber wheel pressing the tape on the capstan shaft) and attached by friction to the take up empty reel by rotating it a few turns by hand. WOW, much more difficult to describe than to do! Keep in mind the reels turn anti clockwise direction. The full reel (supply) has to be on the left reel support and the empty one (take up) on the right one. Usually tapes have a leader green tape at the start and a red one at the end to easily identify the side of the reel and be easily handled and touched with fingers without damage the magnetic surface. WOW, much more difficult to describe than to do! Standard unbalanced RCA plugs are provided to connect the recorder to HiFi system in usual way. 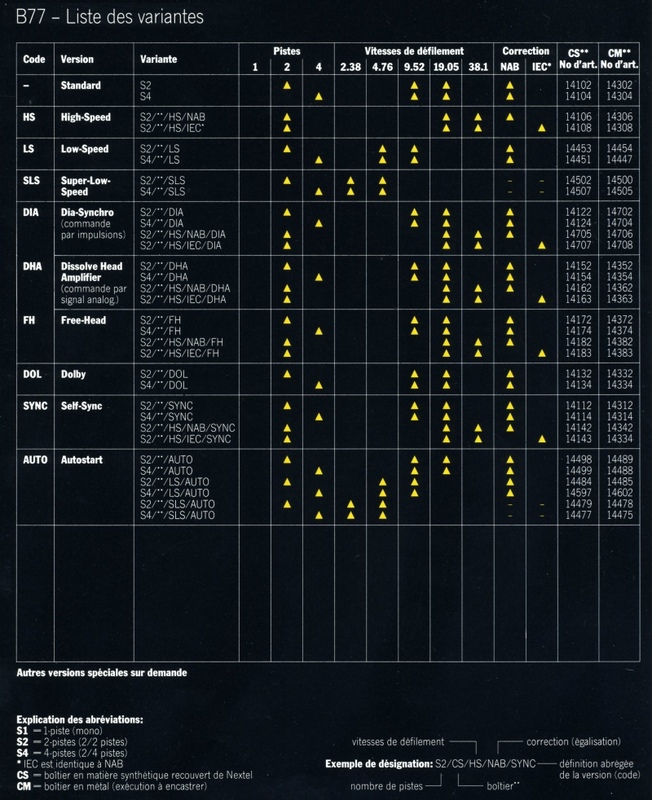 Balanced Canon plugs are provided for semiprofessional or studio recorders. Standard 6,3 mm jacks are for microphones inputs and headphone output for both domestic or professional. Well, you have loaded reels and tape in right position and plugged the RCA cables in your HiFi system. Lets enjoy the music now. Ah, . . . don't forget to turn your recorder on :-) ! 3 heads and 2 independent tracks recorders with the built-in track-to-track transfer facility provide many way for special recording effects and domestic master producing. Here follows a simple description of the main recording effects. DUOPLAY (Sound with sound). In this way both tracks will be played together but the recording on each track takes place at different times. This is the procedure used, i.e., to record the lead instrument or singer on one track and the musical basis on the other one. This is the way used in multitracks recording too where every single instrument is recorded on a different track and not necessarily at the same time. The world wide famous "Tubular bells" recorded in 1973 by Mike Oldfield and more recent performances by Lenny Kravitz and Moby, playing by them selves all the instrument of the recording, are good examples of this technique. SIMUL SYNC (Simultaneous 2 channel recording). Similar to the Duoplay technique but both channel are recorded at the same time. This doesn't affect the musical program by time delay between the two recordings (which is the main problem of Duoplay system). MULTIPLAY (Sound on sound). In multiplay recording information contained on one track gets transferred onto the other track while adding new musical signal or voice at the same time with perfect synchronization. The number of possible back and forth transfer operations on the tracks is limited by the back ground tape noise which adds up to every passage until it became clearly audible. This is why the recording level have to be fine adjusted in multiplay recording and they needs some experience to have best result. Echo effect. During the recording the monitor play head reads the information with a 0.34 sec (at 3.75ips) or 0.17 sec (at 7.5 ips) time delay. This delayed signal returned to the recording channel produces the echo effect added to the original signal. Talking with many people I heard some confusion about the BIAS and IEC & NAB EQUALIZATION curves. I will try to clarify in simply words. Basically speaking the so called BIAS, in magnetic recording field, is an high frequency signal (usually from 100,000 to 150,000 hz about or higher) recorded on the tape at the same time of musical signal. This principle, discovered in 1940 by accident, dramatically improves distortion and high frequencies response of the recording. 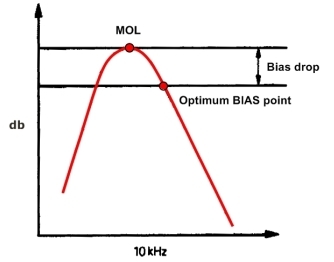 The Bias frequency is always the same but its level has to be adjusted according to different kind of tapes and speed to find the best MOL (Maximum Output Level) with less THD (Total Harmonic Distortion). Please refer to the TAPES page for more info about BIAS setting. So BIAS doesn't have to do with the IEC and NAB equalization curves. 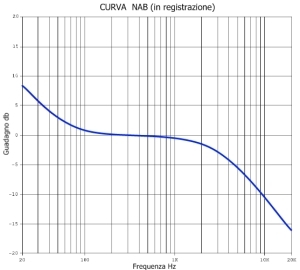 NAB (or IEC II) and IEC I equalization curves are based on the same principle of the most knew RIAA equalization curve used to press and reproduce vinyl discs, but kind and amount of correction is very different from the Riaa one. 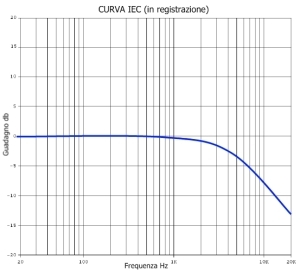 The IEC curve adds a slightly de-emphasis at the high frequencies to compensate the increase and distortion of magnetic heads in this range of frequency. NAB curve adds a pre-emphasis to the bass frequency too. from 7,5 ips up to 30 ips speed 2 or multitrack tracks tapes are recorded according to NAB curve in US and according to IEC curve in Europe (there are no 4 tracks machine at high speed). Because IEC level equalization at high speed allows a better S/N (Signal vs. 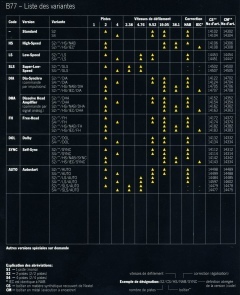 Noise) ratio and dynamic range it is wildly used now in US too for master tape copies and disc cutting. There is no way to modify the NAB or IEC curves as you have no way to change the RIAA curve in your phono preamp. Some consumer tape recorder (as Revox A77, some Teac/Tascam model, etc.) and many professional studio recorders can switch to NAB to IEC according to the kind of tape they have to play. Some 4 tracks reel to reel recorders are equipped with the “autoreverse” function which change the tape run direction (by an optical or metal switch) automatically. They play 4 tracks tapes continuously avoiding turn the reels manually at the first side end. These machines are more mechanical complex with 6 heads (3 for each tape direction) and double capstan and pinch roller. They are rarely used in professional field due to the difficult to have them constantly aligned. The reel and tape are loaded in the same way as 3 heads recorder.